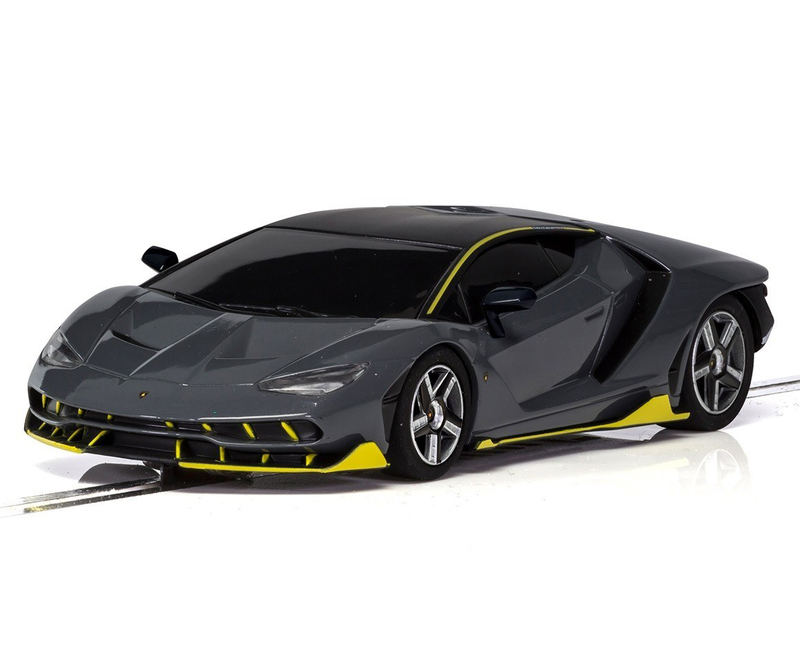 Created to commemorate Ferruccio Lamborghini�s 100th birthday, the Centenario is a limited-edition supercar based on the popular Aventador. Using the Aventador�s 6.5-litre V12 engine, the car produces 759 hp, giving 0-60mph in under three seconds. 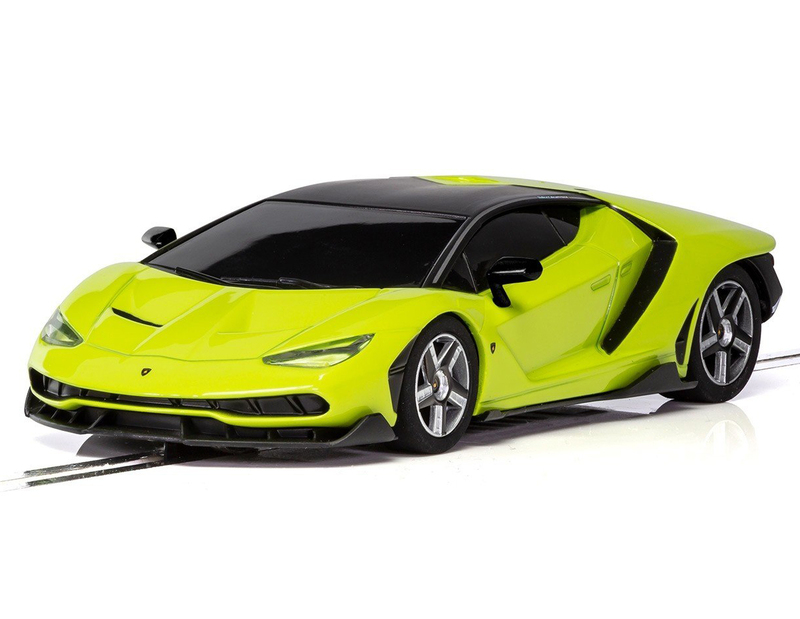 The Centenario has been modelled in green offering slot racers a super resistant car, perfect for intense, high impact racing, allowing you to hit those top speeds! Colour: Green. Digital Plug Ready, Easy Change Pick-Ups, Magnatraction, Super-Resistant. 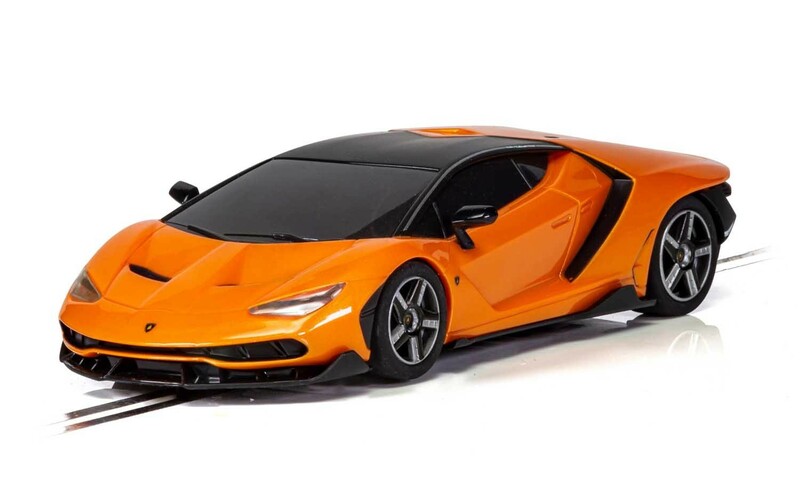 Looking amazing in bright orange, this Lamborghini is anything but subtle! But then, should a Lamborghini ever be subtle?! 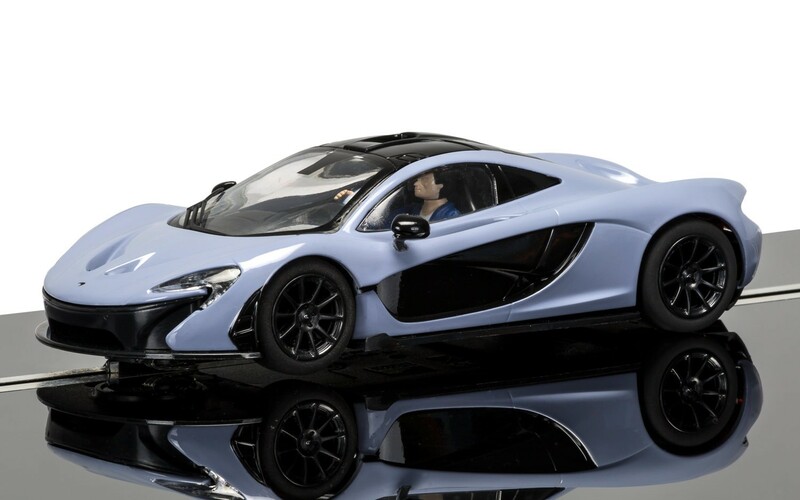 Considered the successor to the McLaren F1, the McLaren P1 sold out in November 2013 having only been delivered to retail customers within the UK in October 2013. 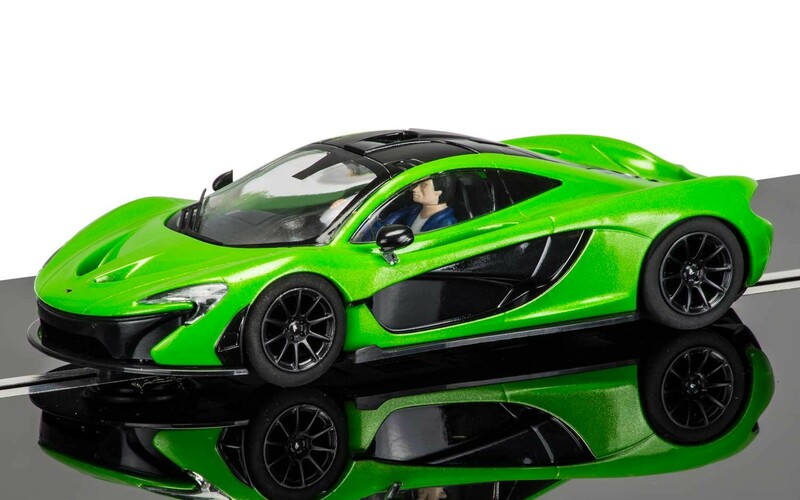 The Scalextric model captures the McLaren P1 two-door coupe in green, following successful releases in yellow and red. Digital Plug Ready (DPR), Easy Change Pick-ups, High Detail Street, Magnatraction, Pro Chassis Ready (PCR), Working Headlights, Working Rear Lights. 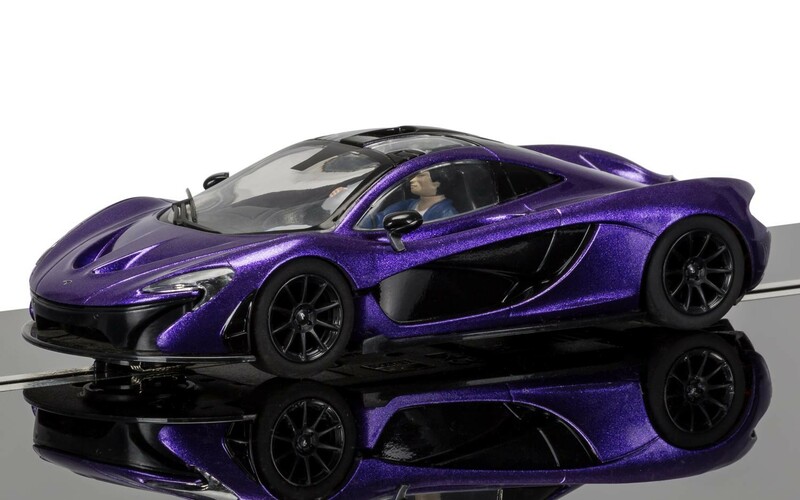 The McLaren P1 is a limited production plug-in hybrid sports car by British manufacturer McLaren Automotive. The concept car debuted at the 2012 Paris Motor Show. Deliveries to retail customers began in the UK in October 2013. The entire P1 production of 375 units was sold out by November 2013. The production run ended in December 2015. It is considered to be the long-awaited successor to the McLaren F1, utilizing hybrid power and Formula 1 technology. It does not have the same three seat layout as its predecessor. The McLaren P1 is a limited production plug-in hybrid sports car by British manufacturer McLaren Automotive. The concept car debuted at the 2012 Paris Motor Show. Deliveries to retail customers began in the UK in October 2013. The entire P1 production of 375 units was sold out by November 2013. The production run ended in December 2015. 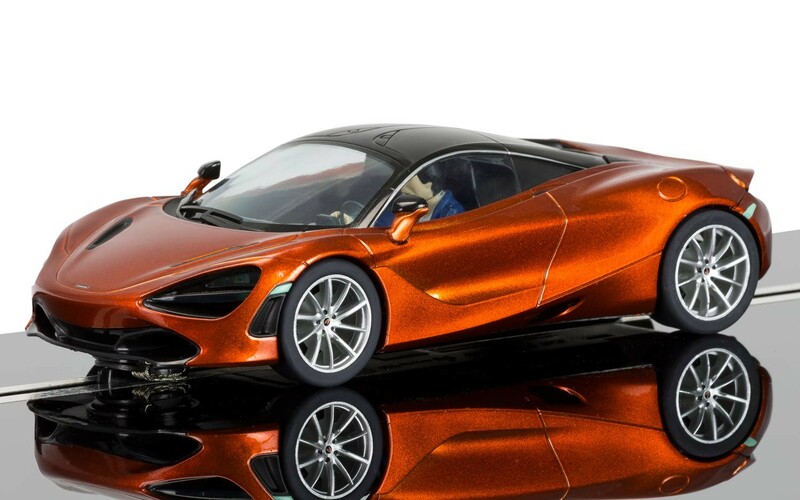 It is considered to be the long-awaited successor to the McLaren F1, utilizing hybrid power and Formula 1 technology. Digital Plug Ready, Easy Change Pick-ups, High Detail, Magnatraction, Working Headlights, Xenon Effect Headlights. 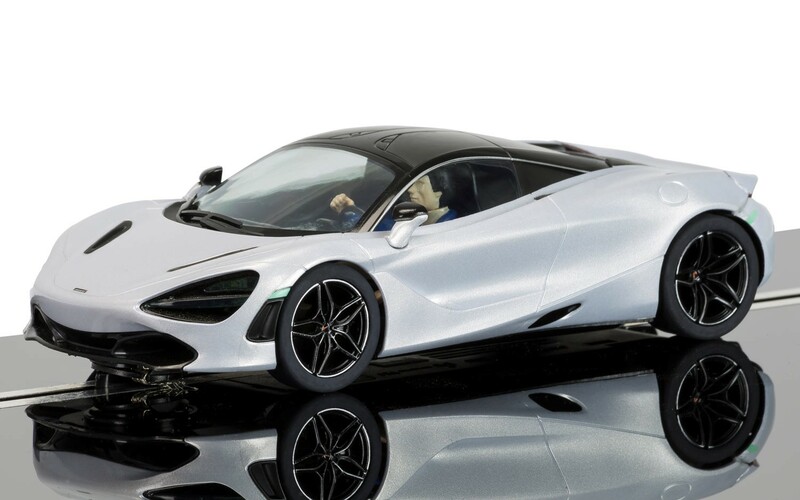 Continuing Scalextric�s long running relationship with McLaren is this exciting new addition to the Scalextric range, the McLaren 720S. Digital Plug Ready, Easy Change Pick-ups, High Detail, Magnatraction, Working Headlights, Xenon Effect Headlights, Working Rear Lights. 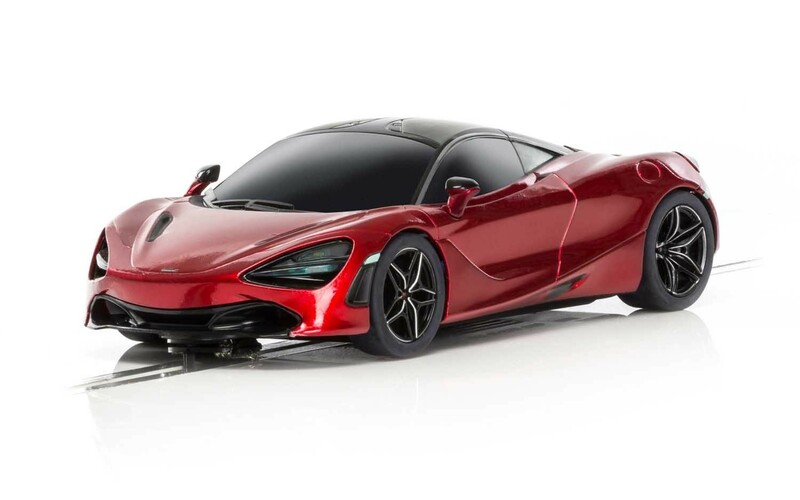 This fantastic McLaren 720s looks even more striking in the vibrant Memphis Red. A true supercar the McLaren holds the road with grip and poise and has all the power a car could need. A new addition to our police car force! 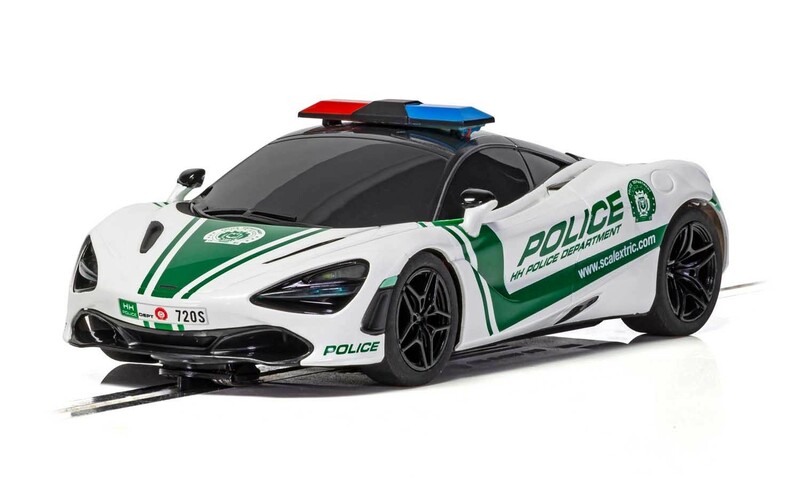 This McLaren 720S features working siren and flashing lights as it chases down the bad guys on your circuit! 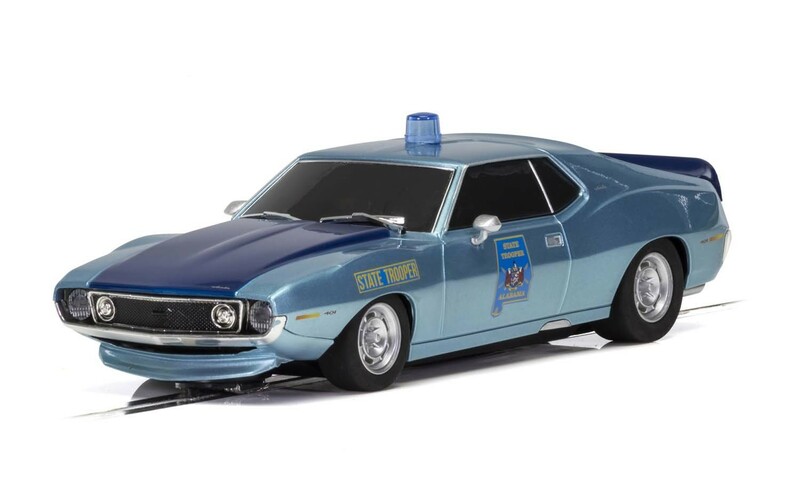 A piece of American muscle car and law enforcement history. This Alabama Police Javelin is sure to catch the crooks. 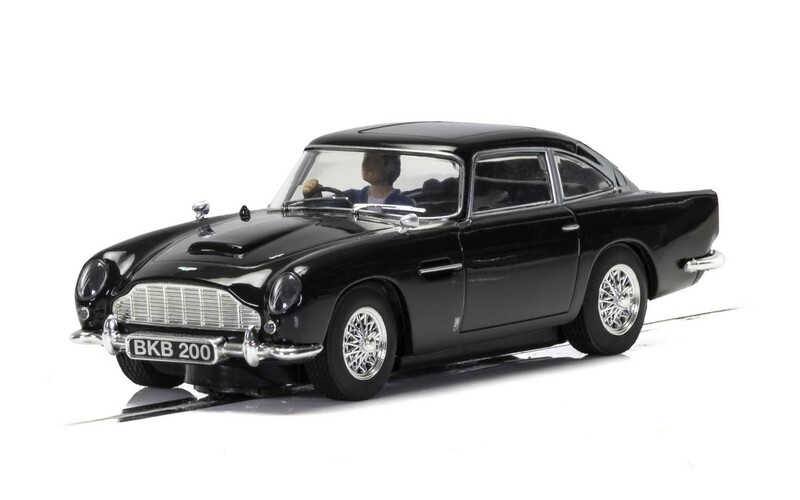 The DB5 looks amazing in any colour, not least in this superb deep gloss black. 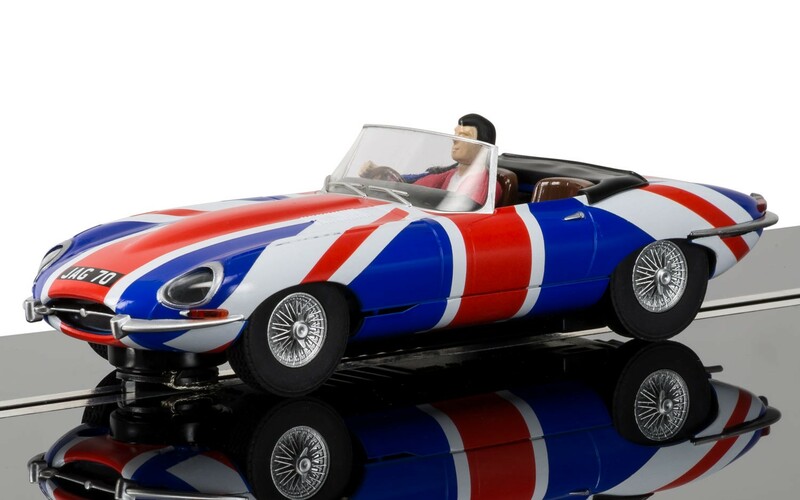 Famously called �the most beautiful car ever made� by Enzo Ferrari, the Jaguar E-Type was originally unveiled at the 1961 Geneva Motor Show as a high performance and competitively priced sports car. The legend goes that the E-Type selected to be unveiled at the 1961 Geneva Motor Show was driven from the Browns Lane plant in Coventry, by Jaguar executive Bob Berry to Geneva arriving just 20 minutes before the global reveal with only a few minutes for a quick wipe down. 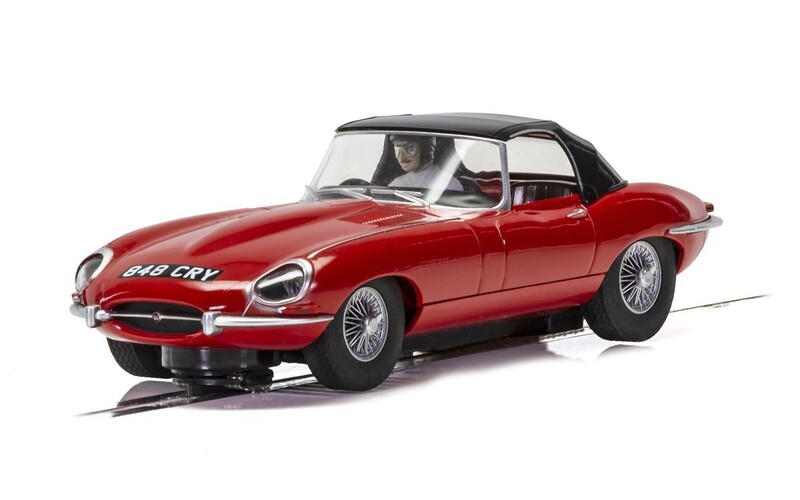 More than 50 years after its launch the Jaguar E-Type is widely considered a design icon and notable landmark in automotive history, and one that you too can recreate in its swinging 60�s inspired paintwork. 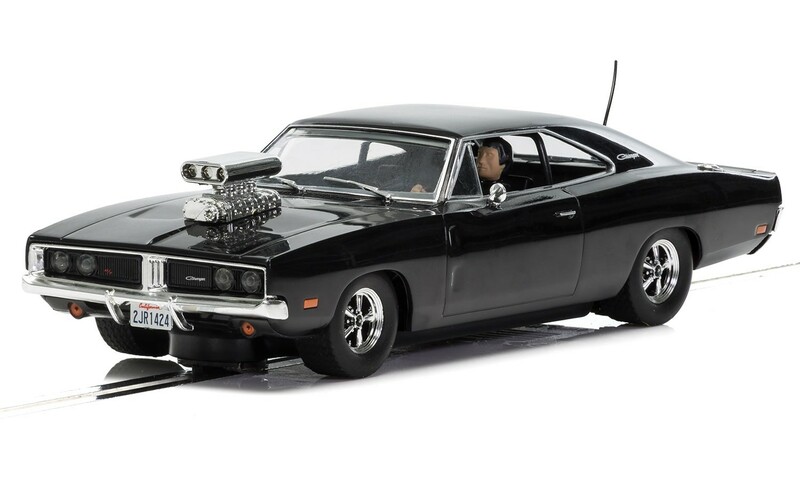 A car recognised by almost everyone, the Dodge Charger with a blower. Nothing represents the American motor industry quite like it. First produced in the mid-to-late 1960s. Digital Plug Ready, Easy Change Pick-ups, High Detail, Magnatraction, Working Headlights, Working Rear Lights. 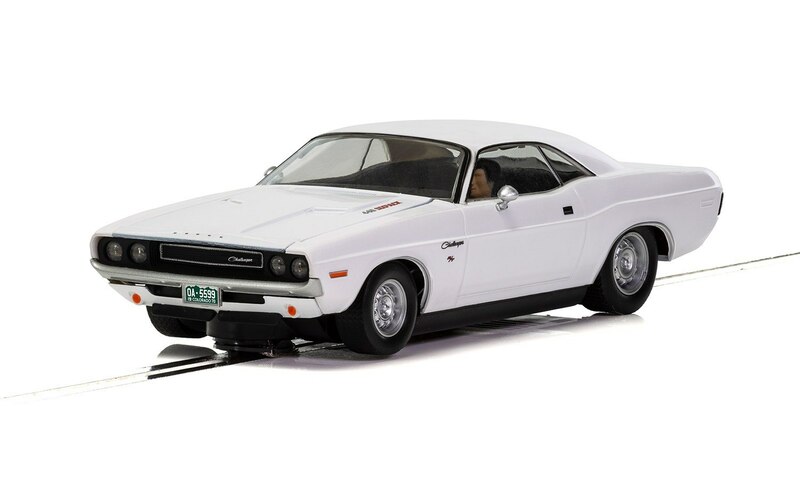 The Dodge Challenger is another icon of the unrivalled American Muscle car scene. Successful both on the track and on the street, it has endured as a lasting symbol of both motoring freedom and the power that the muscle car can give working men and women. Colour: White, Year: 1970. Digital Plug Ready, Easy Change Pick-Ups, High Detail, Magnatraction, Working Rear Lights, Xenon Effect Headlights. 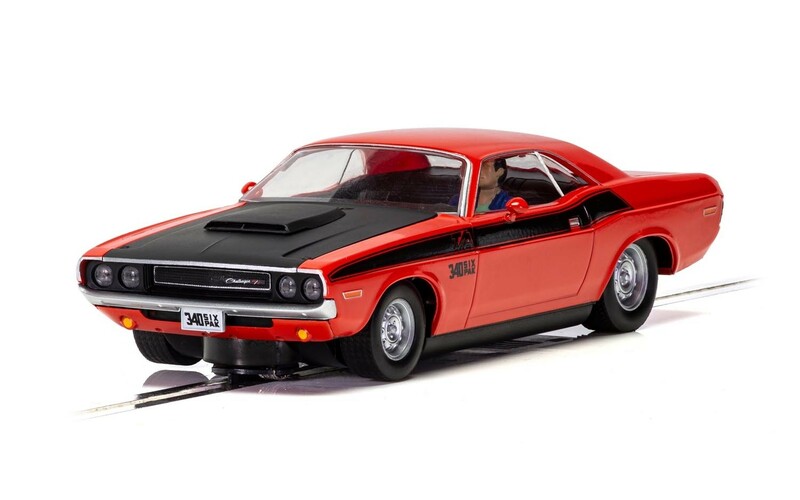 Looking sinister in red and black this Challenger is a true piece of American Muscle. 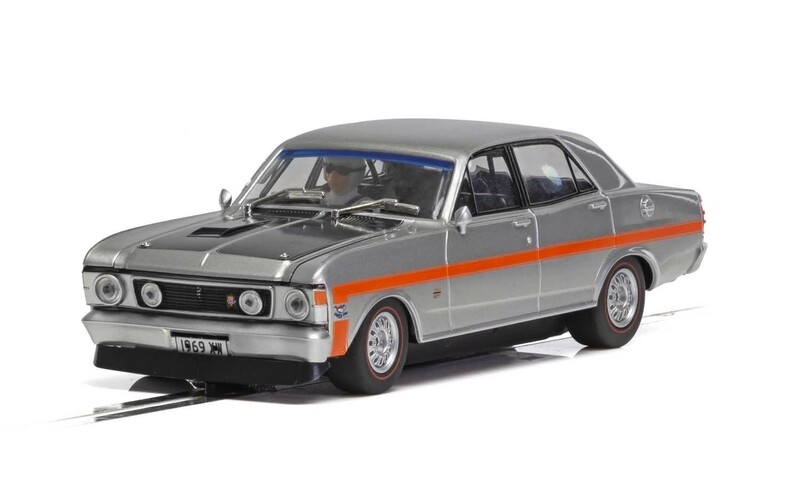 The Ford Falcon (XY) was produced by Ford Australia in the early 1970s, offering a number of improvements over the previously manufactured XW Falcon. Over 100,000 XY Falcons were produced in a variety of different colours. 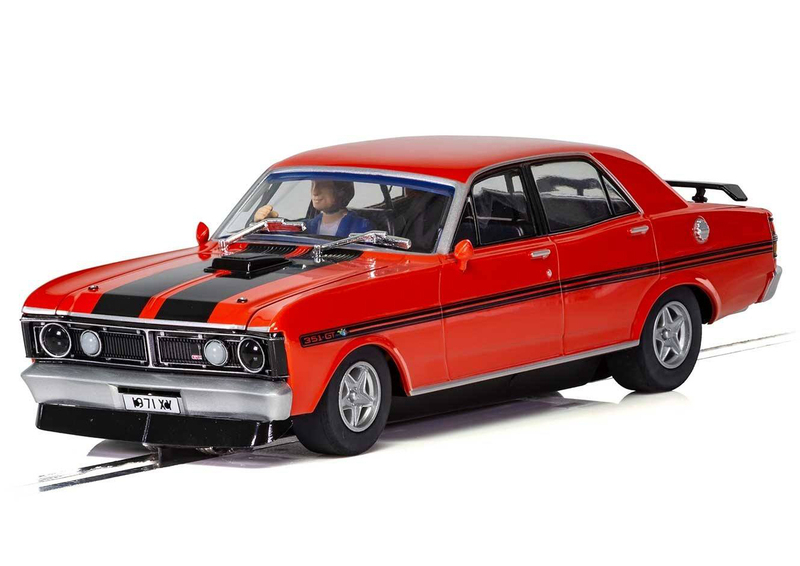 The XY Falcon here is modelled in a striking Candy Apple Red, a popular livery not just in the car�s native Australia but also beyond. Colour: Red, Year: 1970. The original Mini was launched to much fanfare and critical acclaim in August 1959. The first Minis were in fact branded Morris Mini Minor and were sold as a small, cheap, dependable family car, whose exterior size masked a surprisingly roomy interior, space enough for four adults and some luggage in the compact boot. As the design matured the Mini became not just a star of the school run, but also the rally stage with the car storming to victory in a number of world famous Monte Carlo Rally�s. on track the car found success too, dominating the lower engine size classes of various saloon series right up until the mid-1970s, Sir Alec Issigonis has truly designed a compact masterpiece. As the swinging 1960s came into full force the Mini became an icon of motoring, taken to the hearts of celebrities from Peter Sellers and John Lennon to even American film stars such as Steve McQueen the mini was to be seen on boulevards in LA as well as side streets in Leicester. It was a car for all and even took to the big screen in some well known films. Today the Mini is 60, but it is still loved across the world, be it at Goodwood still humbling big power saloons in motor racing or at owners clubs and rallies, at 60, or even 64, we all still love the mini. 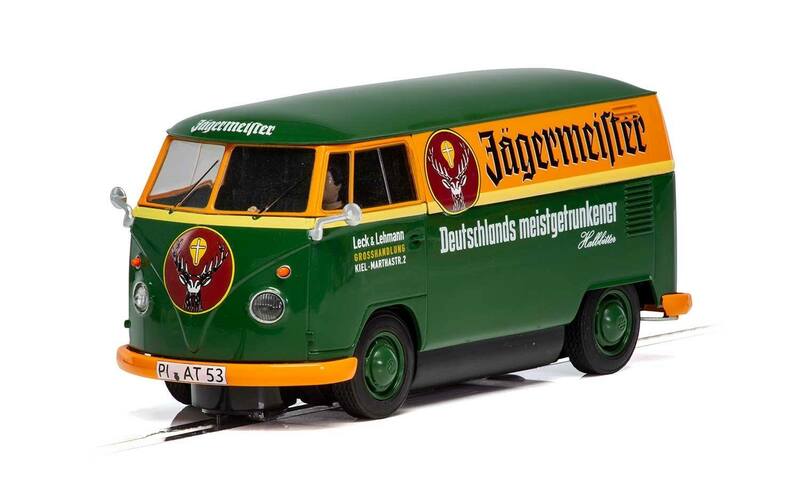 The popular VW Panelvan has been used for a variety of purposes for many years. 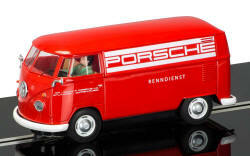 One common use was as a race support vehicle such as the Panelvan modelled here. 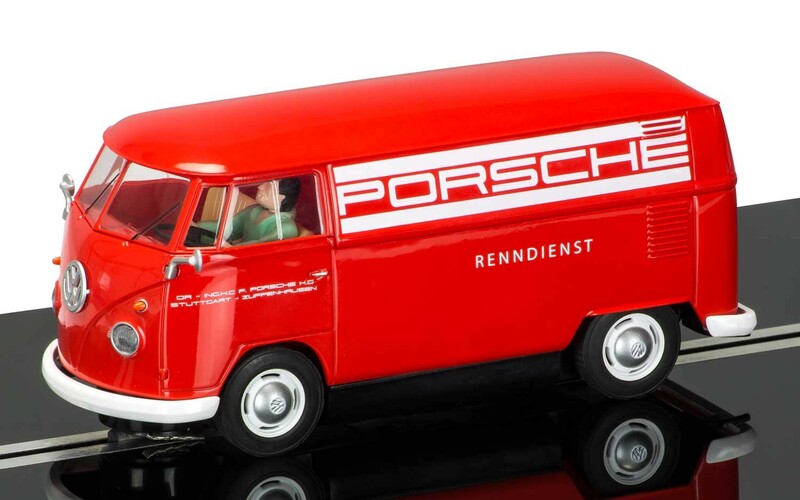 Produced in striking red carrying the Porsche logo, this van would have followed the racing team around the country, playing a vital role in all repairs. 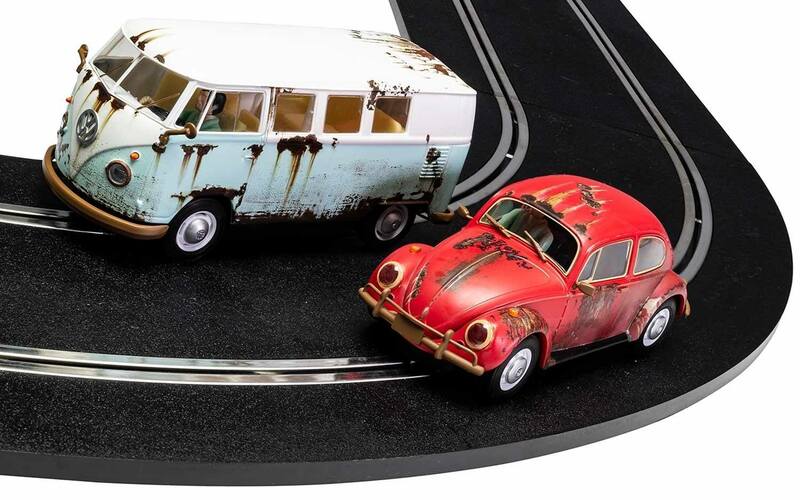 Despite today being highly desirable collectors cars, the Volkswagen Beetle and T1b Camper van did however go through an era of being both out of fashion and affordable to those on the fringes of modern society. 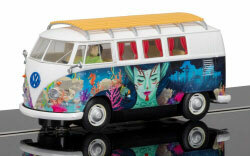 The surf culture of the 1970s/80s saw many flock to the plentiful, cheap and easy to maintain air cooled Volkswagens. 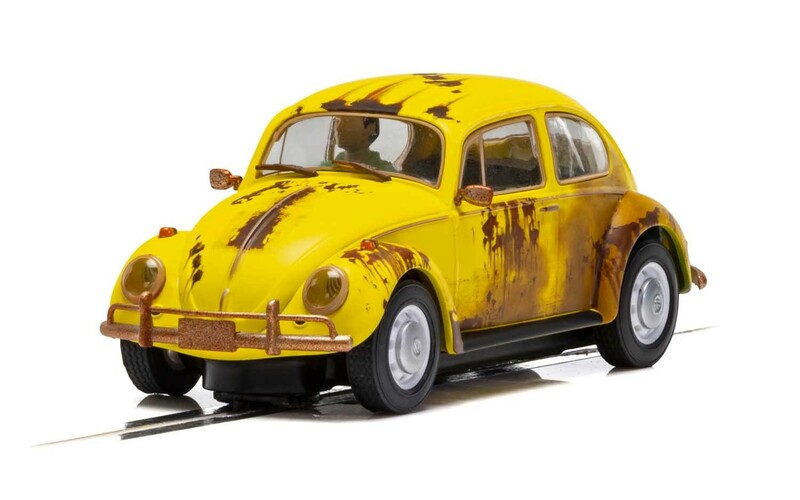 As the cars became more popular some sought to keep the cars going, but allowing the body to look faded, rusty, and generally downtrodden. Thus �Rat Look� was born. 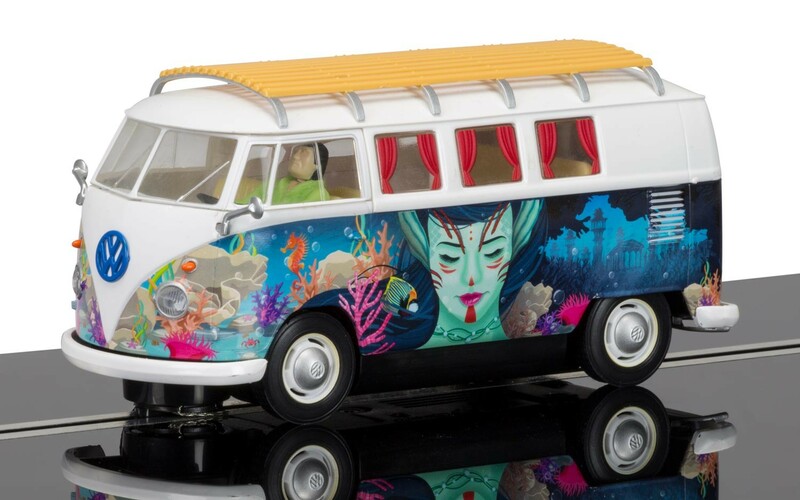 Popular also on 1950s American trucks and pickups today it is a much followed automotive scene, with many seeking to make once immaculate cars into replicas of the sort of cars those who surfed all day and partied all night used to park on Californian beaches. Digital Plug Ready, Easy Change Pick-Ups, High Detail Magnatraction, Working Rear Lights, Xenon Effect Headlights. Scale: 1:32, Limited Edition: Yes, Limited Edition Size: 2,000. Two icons in one package. 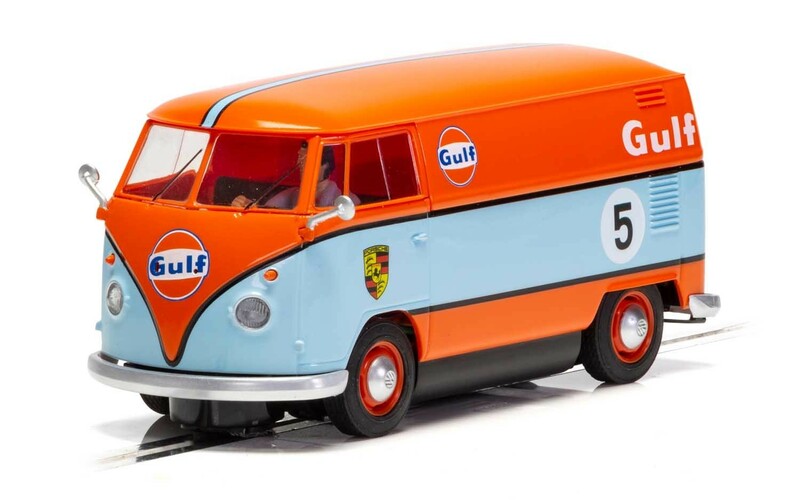 Used as a transporter to the works Gulf Porsche race team, this T1b panel van is a sure fire collectable. 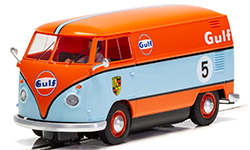 Haven't found the slot car / Scalextric product you want?